I'm so excited to share my thoughts with all of you about this book. But first off I want to tell you how much I love this cover. It's one that on the shelf in a store would catch my attention mainly because of the color. I love the font and the other little detail on it. Plus the tagline well let's just say it caught my attention and I knew I had to read this book. With that being said let's talk about the book itself. 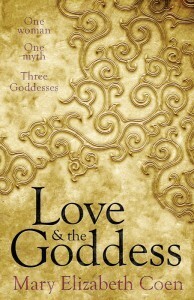 Love & the Goddess, is one that pulled me in and kept me there till the very last page. It is a book kind of like Eat Pray Love, yes I said like because I loved the plot of this one a whole lot more. This plot line has more detail and thoughts into it than Eat Pray Love does, so that is why I said like. Love & the Goddess is a story about a woman's journey to finding herself. It is chalk full of great characters, ones that I connected with and loved. I would have liked to see Kate's feelings more in some situations but other than that this book is fantastic. Reading through this book is a journey in itself, as you go through each thing with Kate and you can picture everything she sees. It's more like a movie than a book really. I love books like this one because you can almost touch everything she touches and see's exactly what she sees. Mary Elizabeth Coen, does a fantastic job with this. Her writing style flows right along with the plot along with her descriptions and you have a perfect book that draws you in and doesn't let you go. I would recommend this book to any book lover, especially the ones that love Eat, Pray, Love. 100 out of a 100 = A 5 Puppy Rating.